My mom and I are hitting the road and heading north for the Publix Savannah Women’s Half Marathon & 5K! Racecations are among my favorites. Not only do I get to travel, but I get to run in new cities. That means new people, new courses and new things to see. For me, it’s become the cherry on top of the wanderlust sundae, and even though I’ve visited Savannah several times, I’ve never actually raced there. It’s about time. So let’s see what this upcoming weekend has to offer! Before you hit the road, make sure you have all your race day essentials. Even though Savannah is a major city with lots of retail options, it’s never fun to have to run those last-minute errands and hope you can find the right flavor Gu or preferred style of socks. I never worry about packing a couple of different options of outfits to wear. Weather can always change last-minute, and I always want to have exactly what I need ready to go. Rain is in the forecast, so I am making sure to have a visor to keep the water out of my face, my anti-chafing spray, as well as a few small plastic bags for my phone and iPod. The first thing to do upon arriving in Savannah is hit up the New Balance Fashion Fitness Expo. Located in the Hilton Savannah Desoto from 10:00 AM – 8:00 PM, the expo is the place to pick up race packets (including bib numbers, gear check bags and the race’s signature tote bag). With that out of the way, you can take your time checking out all the latest fashions and race-branded merchandise in the New Balance area, as well as shopping with some of the different local vendors. Race expos are always fun for discovering new products and I’m excited to see what this one has to offer! 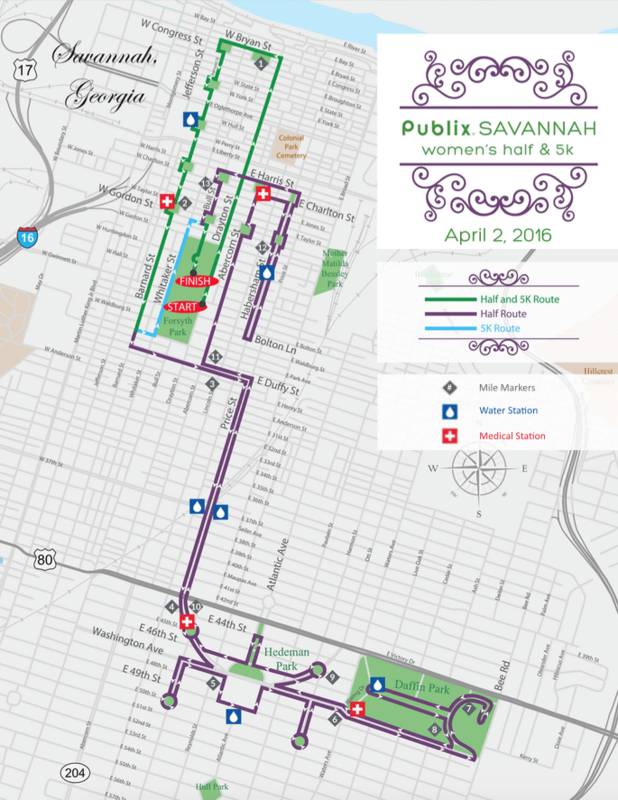 Make sure to eat a nourishing pre-race dinner – in Savannah, it’s not hard to find delicious restaurants with tons of great offerings, so the sky’s the limit! And then get to bed for a good night’s sleep! Saturday, April 2 – Race Day! The Publix Savannah Women’s Half Marathon & 5K is scheduled to start at 7:30 AM, from the iconic Forsyth Park. I am a big fan of getting to the race start pretty early, to give myself enough time to check any gear, hit the restrooms and settle my nerves. 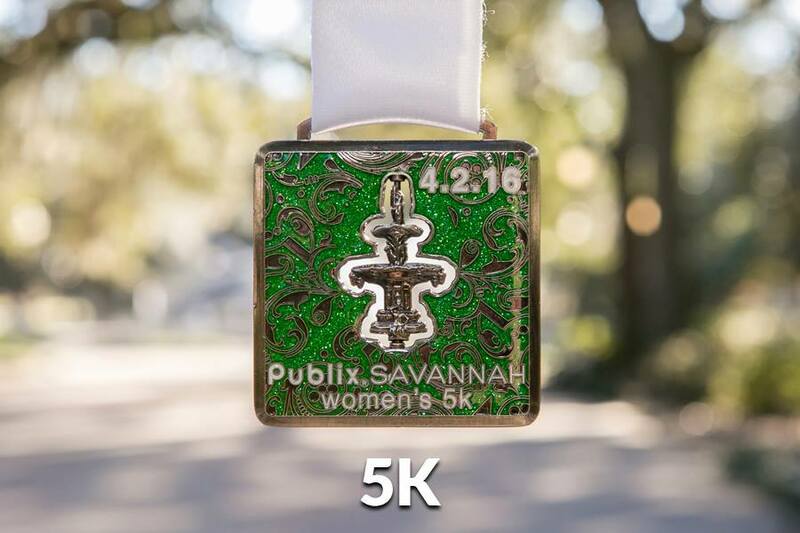 There are plenty of water and medical aid stops along both the 5K and half marathon routes, and of course the views of all the historic shares and architecture of Savannah will make the miles fly by. 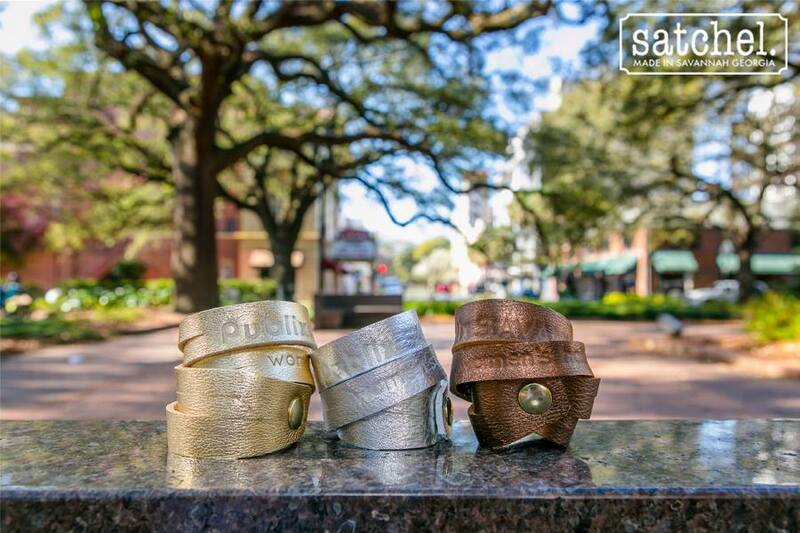 But check out the prizes for the age group winners: leather bracelets, from satchel. After the race, stick around for the party! A Nickel Bag of Funk is slated for two performances in Forsyth Park, and runners can partake of food, drinks, prizes and awards! It promises to be an awesome morning! Recovery is an important part of running, and stretching out the muscles after a run is just the ticket. Grab your mat, towel and water, and head over to Ellis Square for Yoga on the Square at 9:00 AM. This is a great time to decompress after a race well run, and work out any post-race aches and kinks. All in all, it promises to be a great weekend. 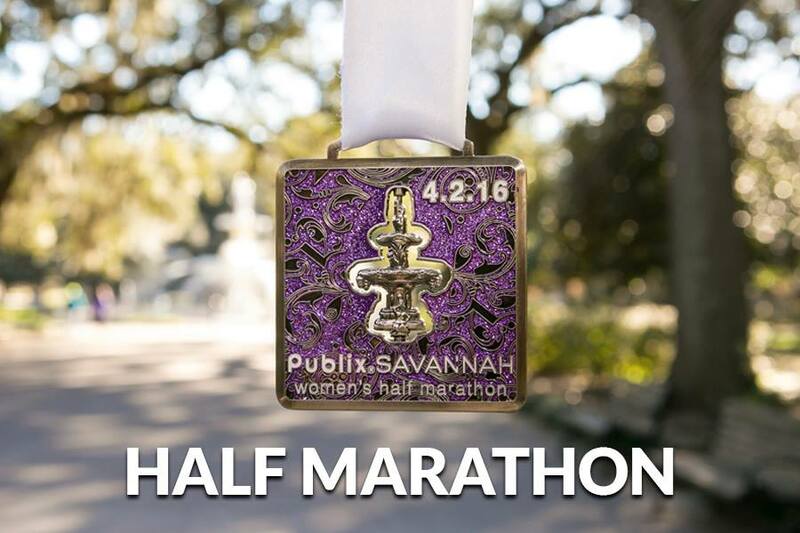 Fingers crossed that Mother Nature plays nice so we can enjoy everything the Publix Savannah Women’s Half Marathon & 5K has to offer! For weather updates, please watch the official race website, Facebook and Twitter pages. Will you be joining us in Savannah this weekend? Goodluck this weekend! I love racecations too. I am heading down to Atlantic City for an 11k April Fools race. How fun that they are having a yoga on the lawn the next day. I cannot wait for the recap! I’d love to do this one.